and turned into this quilt! and i did loops and stars! measures - 54" X 60"
measures - 15" X 39"
Beautiful! 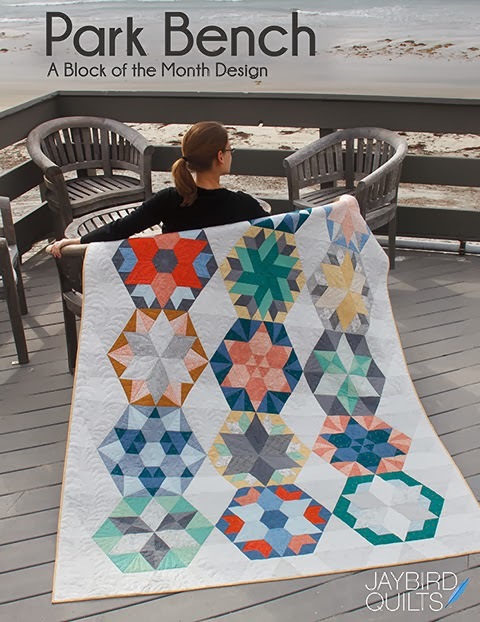 I love the star quilting. Thanks for sharing! LOVE the quilt and the quilted stars you added... thanks for sharing and God Bless our troops! 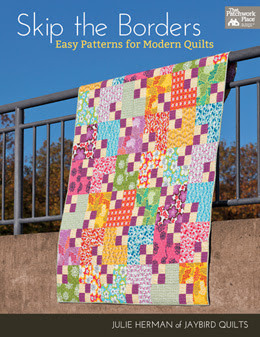 oh, I love it Julie......I love your quilting in loops and stars, makes me want to try that. Beautiful. I love the stars all over this quilt. And the label is very fitting. That's a great quilt! My first quilt I made was red, white and blue, so I'm partial to those. 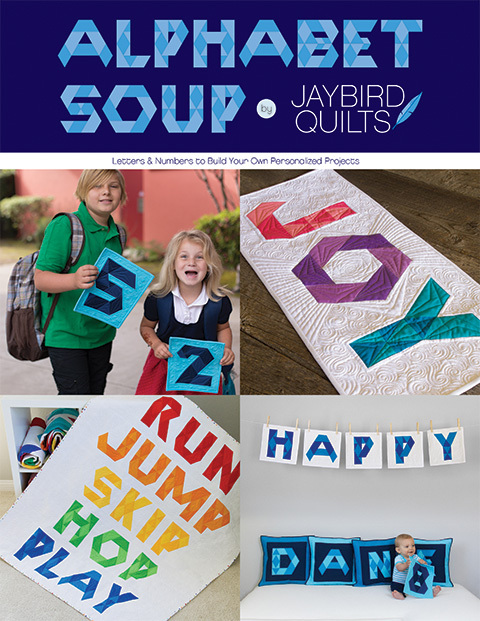 Cute quilt and your Mom just gave me a reason to have to have an embroidery machine! That tag is adorable. I just last night wrote on my new project with a permanent marker and washed it right away before setting it in and it is now a big blur...that wouldn't happen with an embroidery machine! 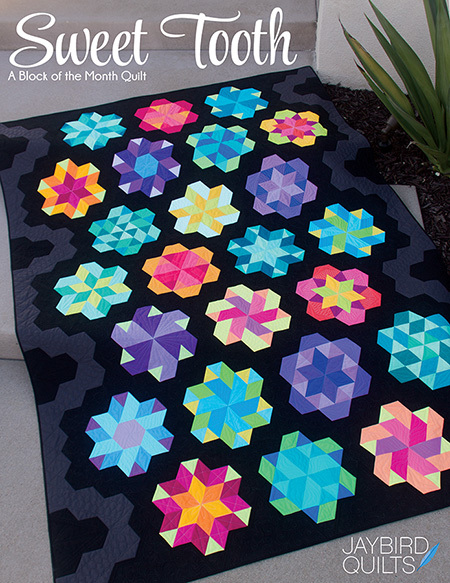 Hey, I have this quilt pattern! So cool to discover it's yours! 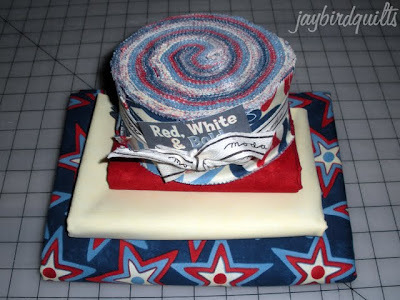 Love the stars scattered among the jelly roll strips, and the quilting design. 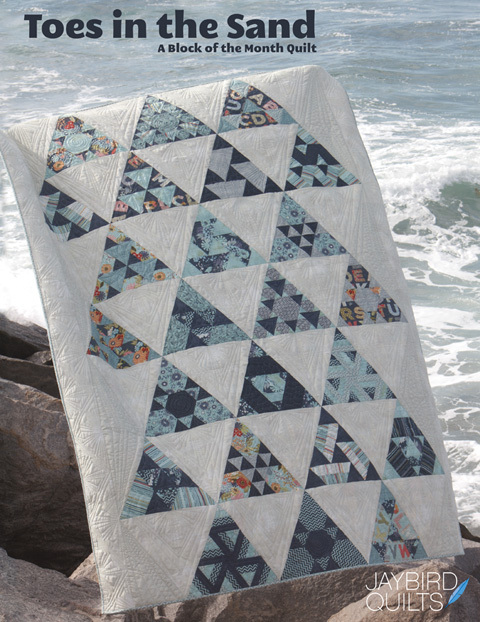 Such a perfect summer quilt. so, i'm a little inexperienced in the quilting world.... how did you do loops and stars? on a machine? is it something you program it to do? wow. i love it. Great quit Julie, I do love the simple strippy quilts with a the accents to jazz them up. They really let the fabric show off and yur quilt is great, a very fun touch. 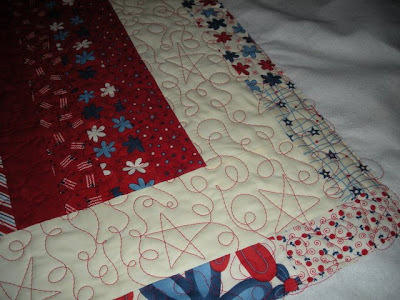 i have a mid arm quilting machine that i use to do most of my quilting.... info on my machines can be found here it makes is so that you can think of the quilting as "drawing" on the quilt... so i drew the loops and stars with thread. 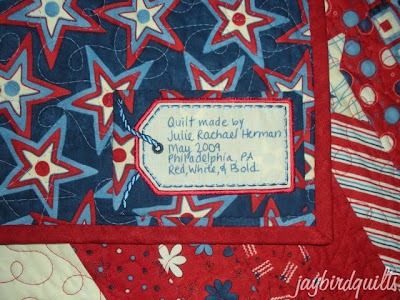 Darling patriotic post....love your quilting! Oh Julie I love this! Thanks for sharing today especially. Very cute! I love your label too! i always enjoy seeing red, white and blue. very nice work. Love the patriotic quilt and table runner. I hope u had a great holiday! I just love that quilt. How fun! So cute!! 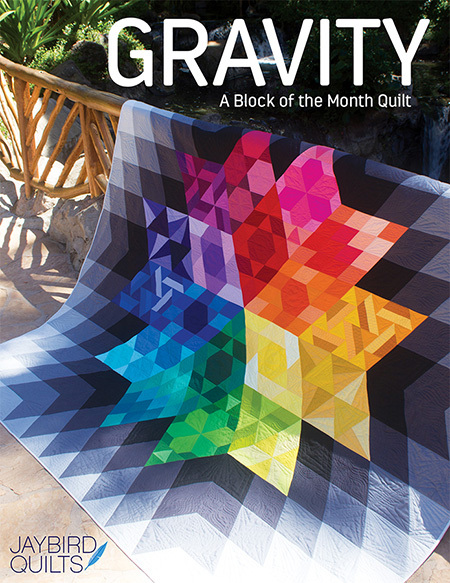 I have some of that fabric, made a table runner and love it...but I gave it away :( Love your quilt and the star and swirlys are perfect! Nice! I especially love that little table runner! Lovin' that quilt! 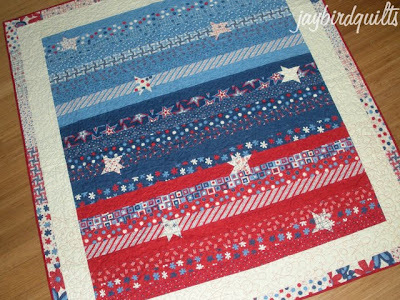 I love the stars and stripes... and the quilting. Each section getting it's own color? Brilliant! Love the loops and stars. Very cute.